Yes, a pie girl is making cake again. 😉 This is when you know the recipe must be really, really good, or else, a pie eater is not going to pay attention to this type of dessert, right? In this picture I used candied Bael fruit, (we will discuss more about that later), but you can use many different kinds of candied fruits or you can even make one right before you make the cake, if you are using apple or pineapple. 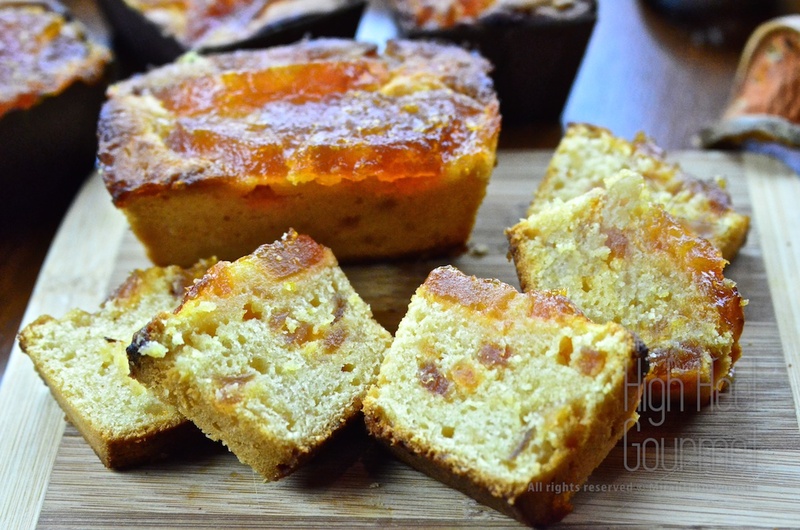 This cake recipe is the one I use across the board mostly with sweet preserved fruits because the cake itself is so good. It’s not too sweet, with that hint of cream cheese and yogurt flavor making the cake so tasty and go so well with candied fruits. One of my friends reported that it goes well with caramelized ginger, too, but I haven’t tried it yet because I rarely make cake. probably only about once every two months. And please, don’t ask if the cake is “heathy.” My answer will always be this: if you want healthy food, don’t eat cake. No matter how light you make your cake, there will still be sugar, butter, and flour. But my choice of ingredients is unbleached flour, organic sugar, true French butter (meaning from a grass fed cows with traditional churning) and organic cream cheese. Doesn’t that make it healthier? Yes, compared to the hormone and toxin filled cake, but it’s still a cake, alright? My solution for staying healthy is EAT YOUR CAKE AND EXERCISE! Next is the candied fruits. I have used these fruits for this same recipe. – Caramelized apples; Simply peel and cut the apples, add them to a pan with plenty of sugar, lemon juice, butter, and salt. Then heat the pan on the stove and cook on medium-low heat until the apples are caramelized to golden brown. Pour the liquor in last and cook until the alcohol evaporates. Usually you will need at least twice the desired weight of cooked apples in raw apples. To get 500g of caramelized apple for this recipe, you will need roughly 2 1/2 lb. Or 1.25kg of raw apples. One lemon, about 300-500g of sugar, adjust it to your taste, 1-2 tablespoons butter and 1/4 – 1/2 teaspoon salt. – Dates; Soak the dates in juice (pomegranate, passion, orange) and the liquor of your choice. 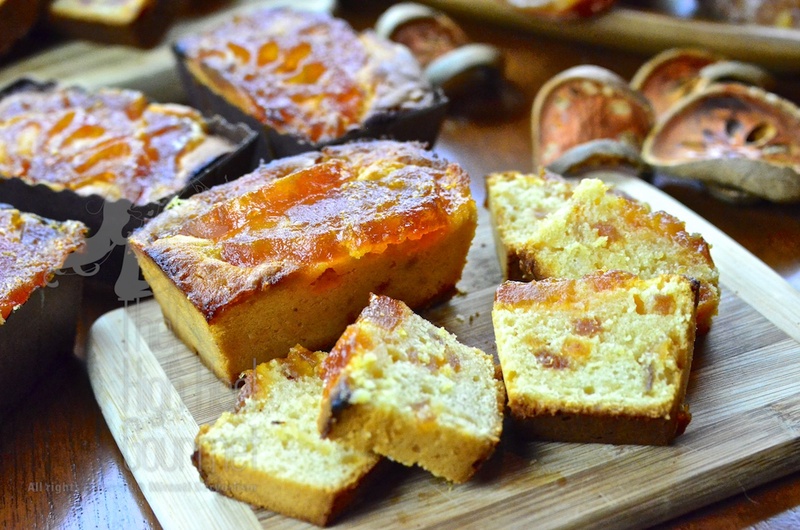 You will only need total 350g of candied dates for this recipe. 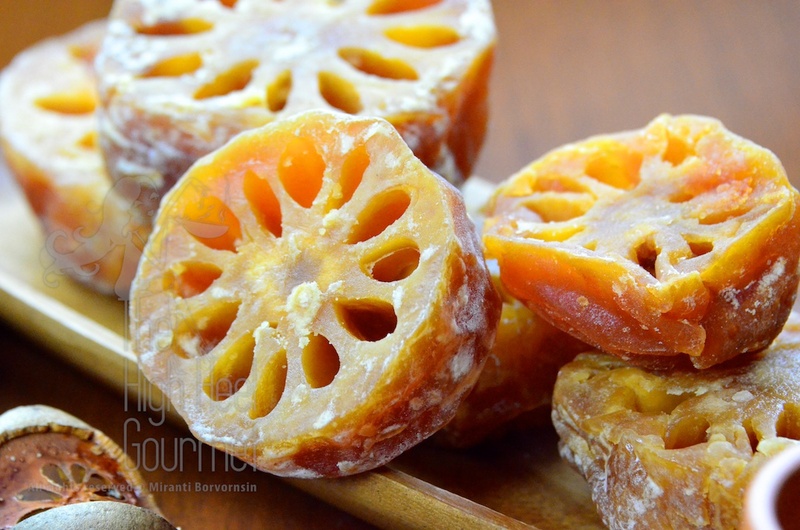 – Candied Mandarin oranges; If they are not so dry, you don’t need to soak them in juice. If there is some syrup soaking the mandarin oranges, use it and add liquor to infuse them. Slice them in to wedge or chips. – OK I ran down the list of fruits familiar to you, now it’s time to talk about my kind of citrus, the candied Bael fruits. Bael fruit has multiple names in English. Bengal Quince, Golden Apple, Stone Apple or Wood Apple are all possible names. It’s fruit from India that spread all the way to Southeast Asia. It is used in medicine and also eaten just as fresh or preserved. It has a very distinct flavor and taste. I don’t think you can buy them outside of Thailand. I don’t even know if any other cultures preserve them the way Thai people do. Bael fruit’s name in Thai is MaTum or MaToom มะตูม​. Most Thai people know Matoom cake pretty well. They post favorite recipes all over the internet, usually of sponge cake. 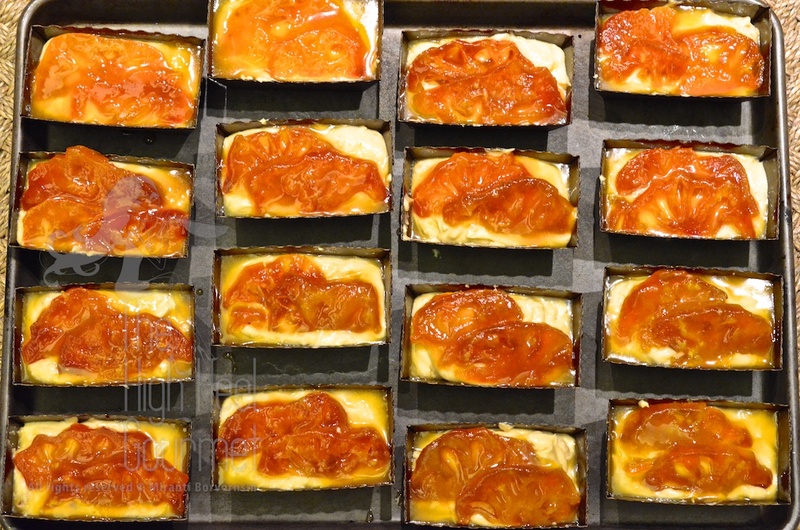 I like sponge cake, but when it comes to candied Bael cake, I like it with butter cake. I developed this recipe for so long using only butter. Then I substituted butter with cream cheese, little by little, until I used all cream cheese and added almond flour. Finally I got my favorite recipe here. 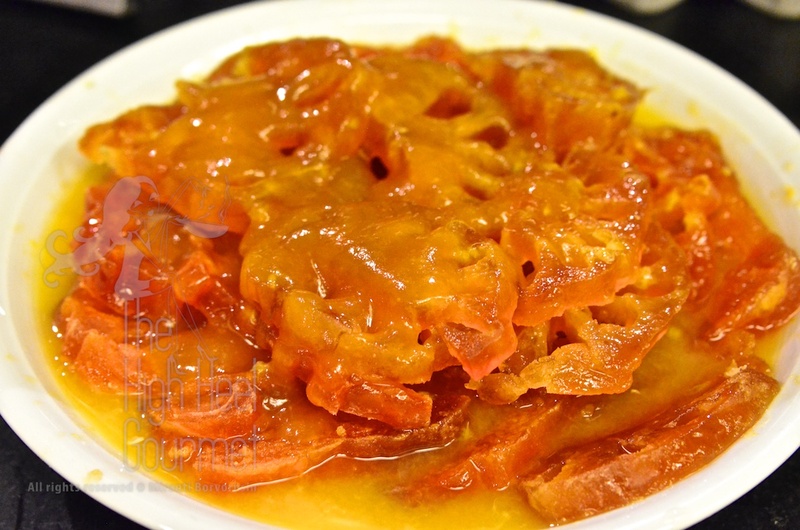 Candied Bael fruits 475g (250g for the cake 225g for the garnish on top) If you are using some other candied fruits, read the list above to see the proportions. The ones for garnish, slice them carefully about 3/8” thick or half a centimeter. Soak them in orange juice and Grand Marnier combined. 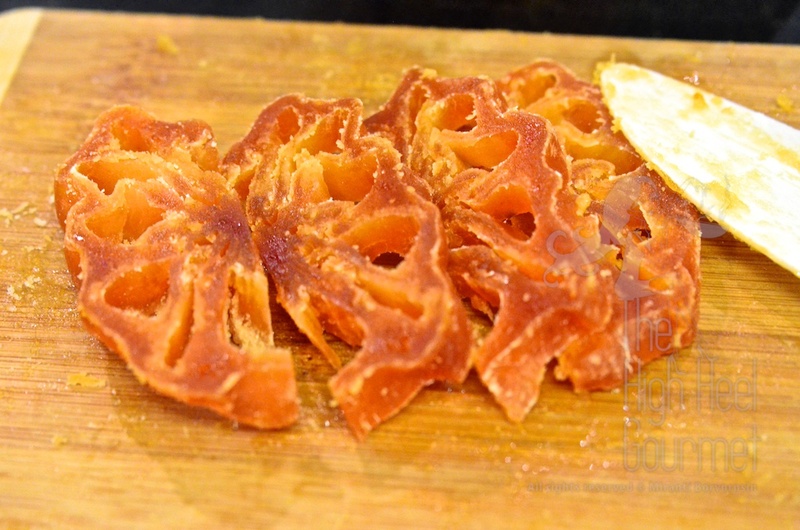 Make sure that the candied fruits are soft but not mushy. 2) Cream the butter and cream cheese together, and then add the sugar and salt. Beat it with a beater at medium speed (DO NOT beat at any higher speed–be patient) until the sugar almost all dissolves. This will take a while. I have to say it again: BE PATIENT! This is the most important stage. The destiny of the cake is hanging on the thread of your patience. 3) Once the butter and cream cheese are creamed together nicely, (Please, don’t keep dipping your finger in the bowl, I didn’t calculate this recipe so you can eat only the butter cream) you can add one egg at a time, beat until the egg is blended well with the butter cream before adding the other one. 4) Strain the Bael out of the orange juice now. Reserve the soaking liquid. 6) Add the almond flour and beat until it’s mixed well. 7) You should have sieved the flour and baking power together ahead of time. (I always promise to myself to do so next time every time, too!…LOL if you understand what I mean.) Now, at the lowest speed–unless you want to wash flour off your hair and kitchen counter–then go ahead, use the highest speed and forget about the cake. There will be nothing left to bake. I hope you like the raw cake dough ice cream! Again, at the lowest speed, add 1/3 of the flour mixture and then one half of the yogurt, then 1/3 of the flour and the rest of the yogurt and finish it with the rest of the flour. DON’T beat too long in this stage. This is the time that you need to be quick and efficient. You don’t want the gluten to develop. I helped you and myself a little bit already with the almond flour but even then, you need to be QUICK! 8) Add the chopped Bael fruit and mix lightly and throughly. I hope you know how to do that. 9) Grease the baking pan. 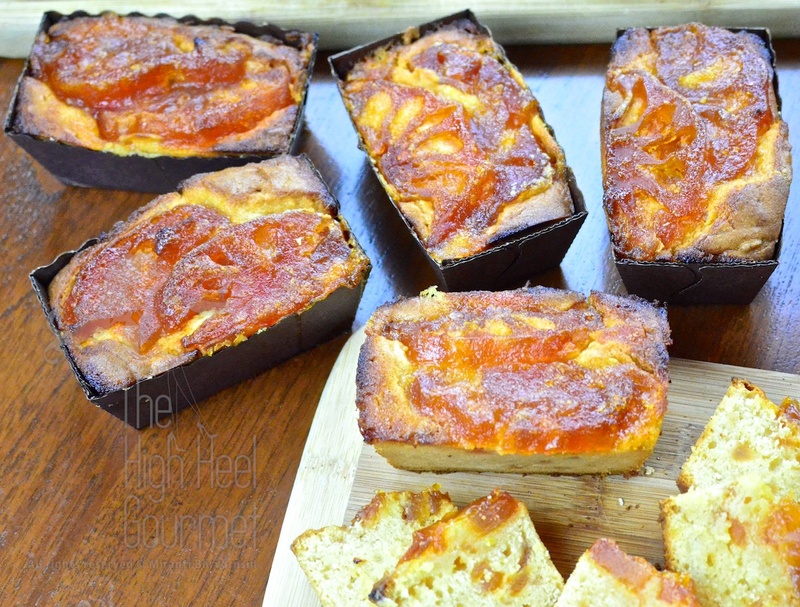 I used a small size pan loaf pan or a tiny paper loaf cup. Each cup is about 1 1/2” x 3”, I think. You can use a larger size pan but then you have to bake them longer. With this tiny loaf, I already have to bake them for 35 – 40 minutes. I had to bake the regular size loaf pan one and a half hours. I don’t want to wait that long. Spread the batter evenly in the baking pans. Then decorate with the larger pieces of the candied Bael fruit and pour the syrup that you used to soak the Bael fruit on top of the fruit. 10) Why wait any longer? You need to bake them! At about half time, brush more syrup on the fruit to prevent them from drying and burning. This entry was posted in All Day, American, Bake, Breakfast, Cake, Cheese, Clicking in the Kitchen, Dairy, Dessert, Dessert, Egg, French, Fusion Asian, Snack, Thai, Vegetarian and tagged Asian, Baking, Cooking, Dessert, Food, French, Recipe, Vegetarian. Bookmark the permalink.